Süper Lage, schöne Aussicht, netter Vermieter, war sehr bemüht.. This spacious and luxurious three-bedroom apartment in Barcelona, is the perfect choice for your Mediterranean vacation. 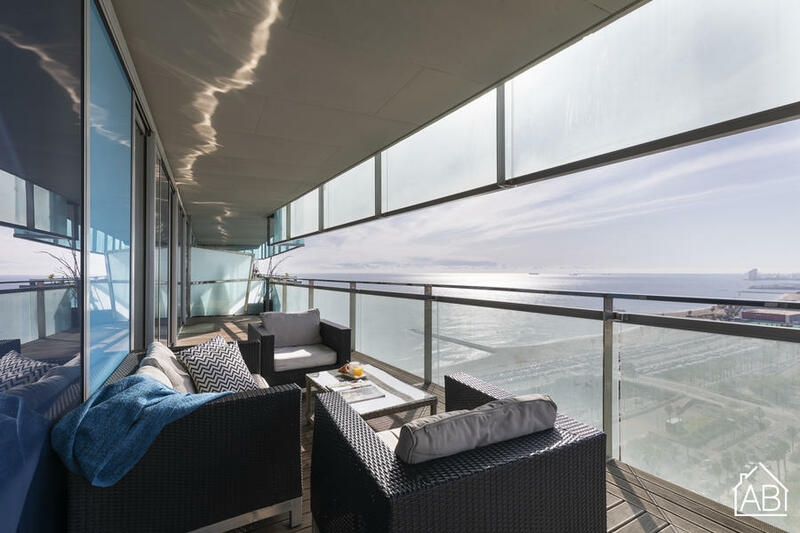 Located in Diagonal Mar, an area considered most modern, guests will have a taste of the contemporary mixed with the traditional feel of the Catalan capital. Streets lined with bars, cafés and restaurants will enchant guests, while the beach is only a short walk away. This apartment is perfect for couples, families or business people visiting Barcelona and can accommodate up to five people. The living room, with large windows giving it much light, offers guests a grand, panoramic view of the city, as well as the Mediterranean Sea. The room is furnished with comfortable white leather sofas, as well as a TV that has satellite. An Internet connection is also available in this apartment, making it easy to stay in touch with friends and family back home. The modern kitchen is fully equipped with all the utensils and appliances needed to create your own home cooked meal, which you can enjoy al fresco on the balcony, while soaking in the amazing view of the ocean. The main bedroom is furnished with a double bed, while the second bedroom has two single beds (which can easily be made into a double). The third room has one single bed. The apartment has two bathrooms, one with a bathtub/shower and the other with a walk-in shower. This luxurious apartment also offers guests access to a swimming pool. With both heating and air-conditioning, this apartment is the perfect choice for your trip to Barcelona, any time of the year.